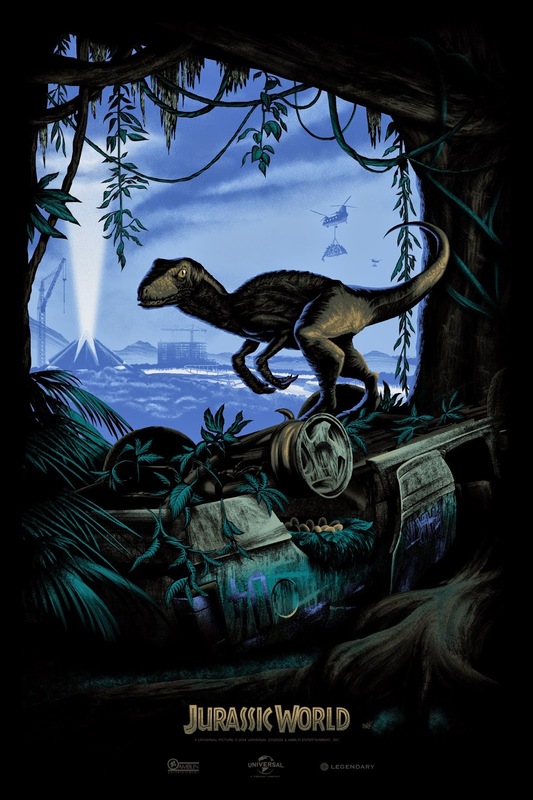 2 days ago Colin Trevorrow, the director of Jurassic World, tweeted the debut of my poster and the response is just phenomenal. It got picked up all over the internet and response has been humbling to say the least. I also got some pictures from the printer, Martin Hammond at Diamond Hill and he knocked the ball way out of the park this time. When it comes to printing my work, nobody does it better. More details have been released as to how to get your hands on one. There will be a giveaway of two sets(regular and variant) at my Facebook group, given away after San Diego Comic Con. The first 75 to 100 people at each drop (tbd location) will receive a card to hold their place in line and will then exchange for a print. Drops will be randomly announced through the below channels. Text will be quickest for you. You don't need a badge to get these, they will be given out at locations near the convention center. 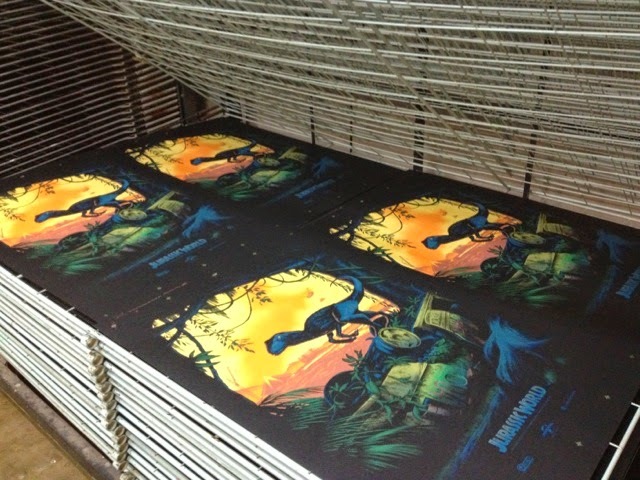 These will only be distributed to those who show up for the drops and do not get a screen print. Our good friends at Legendary will have a small quantity as well so follow them and stop by their awesome booth! 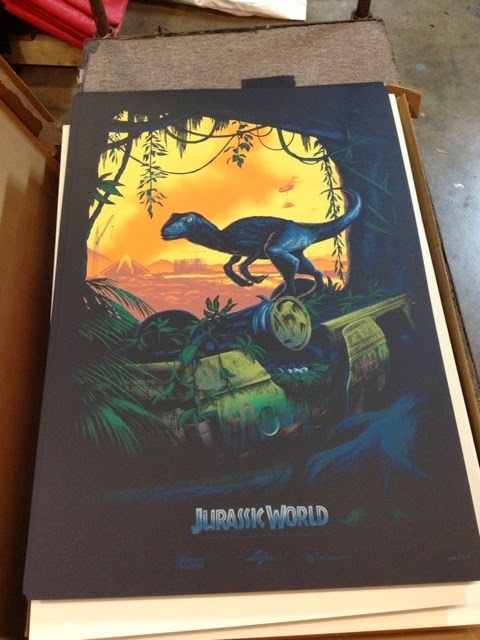 These will be distributed online for free exclusively through Jurassic World social channels, Worldwide! We will hold daily challenges and chose 15 to 20 random winners a day. Ok, now that business is all taken care of, how about some quick art discussion? My primary concern when making a poster is to tell a story within the single image. The most effective tool to achieve that goal is careful attention to composition. Above is a guide to how I laid out the composition in my poster to showcase particular bits of the image in the order I wanted. Most of us read from left to right, top to bottom, so my starting point is there. Even if you don't naturally start there, I tried to force your eye into that spot with the hanging, leafy vine overlapping the orange clouds which leads you to the bigger helicopter(#1). 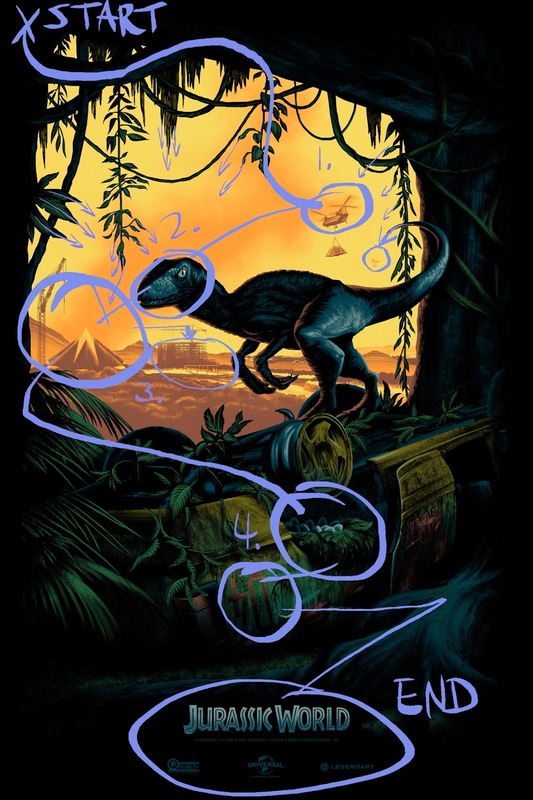 If you continue to follow the orange cloud path, it will take you to the Raptor's face(#2) and then to the building being constructed(#3). The clouds path ends here, but the palm fronds point directly toward the wheel well where the nest lies. 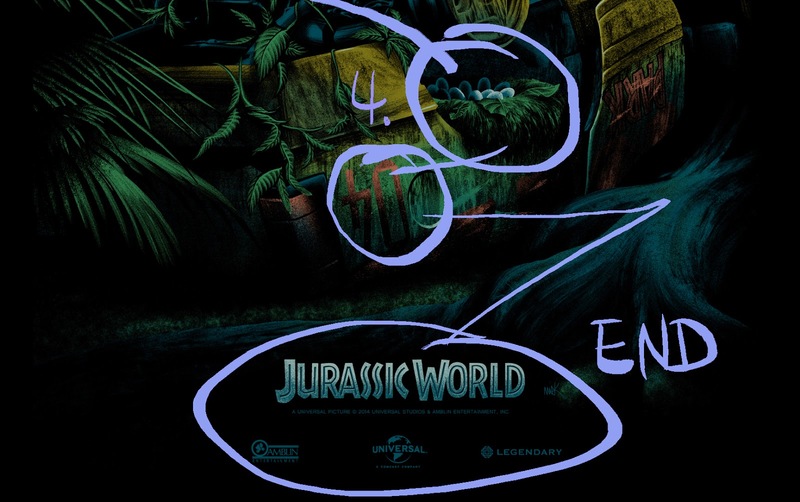 From the nest, there are scratches on the Ford Explorer that point toward the "04" painted on the side and more scratches lead you to the exposed tree roots which make a path directly to the logos on the bottom. Besides all of the work that goes into just producing the image, rendering textures, choosing colors, etc., there is a lot of planning and forethought as I try to serve a larger purpose, beyond a striking image. I'm beyond ecstatic at the response this work has generated. Thanks again to Universal, Colin, Chris and everyone who has supported me leading up to this. I have a lot more coming in the near future and i hope you all stick around to check it out! I've probably been commenting on all sides of social but it's top work fella, great to see the recognition coming through & I'll be keeping an eye out everywhere online as this moves ahead! Thanks for the insights into your creative process. I just think that you nailed it. The details down to the tire being ripped off from 20 years ago. 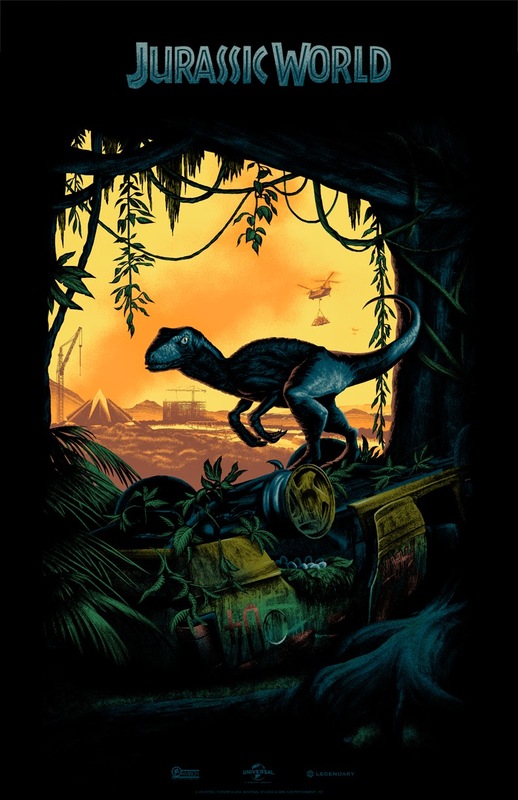 The car and the raptor tell a story with the background, saying there are new things coming, however there are still patches of wild dinosaurs left on the island, regardless of the lysine contingency, but nature cannot be contained, and life finds a way. I tried explaining it to my friend Kaceme about the car. I asked him where that car was from? He said the second movie. I was said no. So I had to explain to him that the car is from the first movie when the T-Rex throws the car off the cliff into the tree with Timmy inside. I figured since we are 26 and 27 he would automatically know that. I'm just glad you guys are getting back to the roots of where it all started. The first movie is by far the best. Mark, is there still going to be a giveaway for the 100 variants? Any idea when? Hi! I love this posters. They´re so amazing. Do you have any idea how can I get one of them in germany? يقتلهم الماء الصابوني بواسطة تكوين طبقة رقيقة فوق مسام التنفس التي تصب في موضعها نتيجة لـ إرتباك السطح ، الأمر الذي يقود إلى اختناق الصرصور.